One of the most treasured fish of the Amazon is the Arowana. The Arowana is a long flat silver fish with an enormous mouth, big eyes and trailing tapered fins. Inside the Arowana’s mouth, you can find a large bony precipice which gives the Arowana its trademark: a bony tongue. The Arowana’s head is bony as well and very well defined. The Arowana’s big eyes give the fish unsurpassable accuracy in hunting. Scientists think the Arowana may have the best sight of all fish in the world. This fish certainly has had a lot of time to evolve its senses. Arowana fossils in the Amazon area have been found from over 170 million years ago. The Amazon Arowana’s predecessor was found in Africa over 220 million years ago. Over time, the Arowana has remained almost the same, making the Arowana a “living fossil.” Arowana can also draw oxygen into their swim bladder, which is lined with capillaries similar to those found in lung tissue. 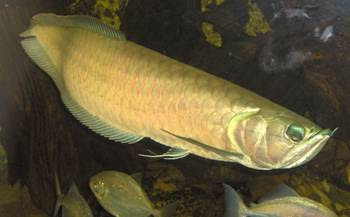 There are three subspecies of Arowana in the Amazon River, all originating from the Osteoglossum. There are other species of Arowana in Asia and Australia. The Asian and Australian Arowana are a little shorter and stockier than the Amazon Arowana. Arowana fish reach around four feet long and can weigh as much as 30 pounds. They are relatively flat, long and have silver bodies. Their tapered fins vary from individual to individual. Black Arowanas have black trim on their tapered fins. 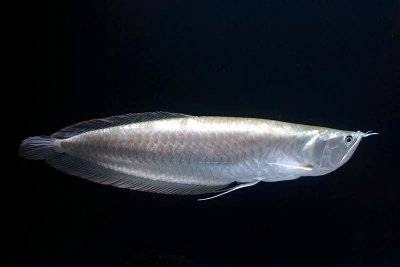 Silver Arowanas can have very little color or a lot of color, which can range from dark grey to a light tinge of pink, especially when they’re juveniles. All four feet of the Arowana is pure muscle, allowing the Arowana to dart at speeds over 25 mph under the water to catch its prey. The Arowana can often be seen leaping gracefully from the Amazon River, reaching towards a stray branch for a small bird or insect. It’s not uncommon for an Arowana to see the shadow of a boat or human along the edge of the Amazon and leap in anticipation of food. While they cannot eat humans, it’s certainly a sight to see the Arowana leap! Arowana have a rather complicated life cycle. Ironically, this king of the Amazon starts out as a very fragile fish. Until they are a few weeks old, the infant Arowana have egg sacs attached to their ventral side which supplies food and nutrition. At this time, young tiny Arowana stay together in groups of 10 or less, finding shelter in the roots of the Amazon tree system. Young Arowanas eventually lose the egg sac at around 5-6 weeks, and at that point, begin to feast on bugs and any small tetras they can find. Once they make it past the first few months of survival, the Arowana is a very hardy fish that grows rapidly. By the time it’s a year old, a well-fed Arowana can be over 1 foot long. This rapid growth gives the Arowana its survivability in the harsh Amazon River where most predators are well over 2 feet long! In the wild, Arowanas tend to stay in loosely-knit groups that have been established through territorial battles. Both male and female Arowanas defend their territory by nipping, body-slapping and charging displays at other Arowanas. When they are old enough to breed (suspected to be around 1.5 to 2 years old), Arowana male and females pair up and build a circular nest in the mud of the Amazon. The female will lay eggs and the male inseminates them in the nest. When the viable eggs are fertilized, the male will gulp them into his mouth and keep them there. Each male carries around 10-20 eggs. When the eggs hatch, the male will let the young fry swim out several times before he finally lets them go completely. Commercial Arowana breeding requires very specialized care, and massive outdoor mud ponds. Most Arowanas from Asian stock are micro-chipped for trade and import and some can go for as much as $6000! South American Arowanas aren’t as highly prized but are just as beautiful and have just as much personality as the Asian species. Full adult Arowanas can leap as high as 6 feet from the water, using their missile-shaped bodies of pure muscle to lift them gracefully into the air. In aquariums, it’s always a challenge to keep Arowanas in the water. Many times they’ll leap to their handler’s proffered food and some have even been trained to leap for their food. The Arowana isn’t for the inexperienced aquarist. A large tank (over 200 gallons) is required, and there are few tank-mates suitable for the Arowana. The rewards of keeping the Arowana are wonderful if you have the time, room and patience!